Roaming Holiday goes on an Roman Holiday! We arrived from Florence to Termini Station, a neighborhood not often considered the best but it is efficient. Here is where we learned our first important lesson: it might cost more, but in summertime it is much more pleasant to take a taxi if you're traveling for a while than taking the bus. The buses from Termini are packed, seriously packed, with little to no AC. If you have luggage this can make the trip difficult. We learned this as we crammed our way into the H bus, headed for Trastevere with some stops in between on the 20 minute ride, sweaty and a bit worse for wear as we tried to stand like backpack clad sardines in our public transport can. But once we arrived into lovely, residential Trastevere, I felt immediately better and like we properly had arrived. We stayed at a small hotel called Sonnino Suite just a block or two across the bridge on the other side of the Tiber, which is what the neighborhood's name means (other side of river). It was a charming hotel, much like many of the places we stayed at here. You're given a key, an old school metal key, and the desk is not 24 hours so you have to let yourself in at night. The building it was in is older, so it had an old school gate-style elevator that was a bit small but luckily we were backpacking. There's not many rooms at Sonnino Suites, but the room we stayed in was surprisingly big for an Italian room, had AC, a decent sized bathroom and was fairly affordable and clean. It also ended up being a great location too; near to public transport, restaurants well within walking distance and literally around the corner, and next to an ATM and a convenience store. Trastevere is almost suburban in nature, teeming with locals and less touristy. Naturally, the food on this side of the river was awesome and less likely to be a rip off as it's very much where native Romans dine. As we arrived in late afternoon, we decided to just explore this neighborhood and followed along with Rick Steve's free audio tour for Trastevere, and from Piazza di Santa Maria made an attempt to go up Gianicolo Hill, which ended up hilariously failing as it was quite an uphill and upstair climb. We did make it to Fontana dell'Acqua Paola, which is right near the Spanish Embassy and boasts an excellent view of the city. There is actually some mountain/hill back there, but the hazy heat obscured it. From there, we were getting peckish and decided to find aperitivo at the much-recommended Freni e Frizioni, a bar housed in a converted garage whose name means "brakes and clutch." They do not mess around when it comes to drinks, and their small plates buffet was quite decent! This was a really cool bar, and definitely busy with the young crowd. Afterwards it was time to rest up, we had a seven hour walking tour ahead of us the next day. We decided rather last minute to book the Walks of Italy Rome In a Day Tour, hitting up major sites like the Colosseum, Forum, Pantheon, and Vatican in one day. We met our guide outside of the Colosseo Metro stop, and began a long and very informative tour through the history of Rome, both ancient and more contemporary. It was on this day that I was eternally grateful for the huge amount of natural spring water foundations sprinkled throughout the city, and that I'd had the good sense to buy a Vapur collapsable bottle to travel with. Because this is a really great tour, and also a lot of walking. A lot. First up, Colosseum, which we learned isn't actually it's true name! It's actually the Flavian Amphitheater, and it became known as the Colosseum because of the large statue that once stood outside of it. One of the most well-known sites in Roman history, this theater was the major source of entertainment for Romans as well as being a huge piece of political propaganda. Gladiators fought brutal battles against each other and animals, mock naval battles were created, and interestingly enough we learned it had one of the most efficient event seating systems for getting so many people inside so timely. Over time, it stopped being a popular destination and was basically left to just exist in the open. Homeless people would make it their camping grounds. Builders would take stone and material for it like it was a trip to Home Depot. Many of Rome's churches are made up of stones taken from the Colosseum. The Romans clearly knew up-cycling would one day become trendy. Eventually, centuries later, the city saw its value as a historical side and did its best to preserve it and in recent years there was quite the arduous, privately-funded project to clean millennia of grime off the stones in an attempt to restore it to its original color. You can see the marked different when visited where stone has been cleaned vs yet to be restored. It's also interesting to note that the theater was even taller in its heyday, and that the whole top section that once existed basically does not anymore. Once, this sand. Lots of sand. From there, we made our way past the ruins of the Forum, once the it place to be where everyone went. We didn't actually walk through them so much as stopped to take a picture and learn a little by it, but then again this wasn't a Forums tour, it's a highlight reel sort of tour. I can only imagine how big this was when it once stood. It was your shopping center, meeting place, where places of worship were. It was the heart of the city, now pillars and a few semi-intact structures. Across from there is the remnants of what was akin to a Farmer's Market back in the day, and now sits as ruins contrasting against newer developments. Such is the case in general when walking around Centro Storico, it is a working, modern city against what bits of it's long history has survived intact. We made our to see other sites like Trevi Fountain and even stopped for some tasty gelato before arriving at the Pantheon, which is quite the sight outside and within. If you ever want to see some Indiana Jones-like sunbeam coolness, go inside the Pantheon at the right time in the afternoon when the sun is out. You won't be sorry. I was able to actually get this in a photo, and luckily the Pantheon is free to enter so you can enjoy this cool architectural phenomenon and some great interior design. With all that touring done, and after a tiring day that ended in the Vatican (which I couldn't get too many pictures of at that point), we headed back to our hotel for a brief rest and then headed to Ai Spaghettari so my partner could get finally get some caccio e pepe, in a parmesan cheese bowl no less! I myself got some tasty carbonara. I had earned my cheese and carbs, earned it I say! Italians usually don't eat dinner until much later at night, 8-9pm being when things really pick up, so it wasn't difficult for us to get tables at our usual 6:30-7pm dinner time. Afterwards we strolled around, taking in the charming little streets and strolling locals, and stopped to get some VERY good gelato at Fior di Luna, which was probably my favorite gelateria we went to in Rome. Even more than Fatamorgana, which was good but I preferred this place more. Then came sleep, and then a sad morning attempt the next day to do Villa Borghese which culminated in me getting actually terrible heat exhaustion problems, having a little bit a frustrated cry over feeling limited by my not feeling well, but ultimately we found some water and were able to rent a segway to drive around the large park. It's a very lovely park, and a very big one! I would absolutely recommend spending a morning here, or evening as there are some great views from many spots in the area. Afterwards, we took a nice siesta back at our room and then went to check out another aperitivo at Akbar, a charming little bar that felt like walking into a bohemian tea room. It's a very cool place that seemed less crowded than Freni, but also had good drinks and good small plates. And, it was just a few blocks from out hotel which was also nice. Overall, I think were I to visit again it would be in late fall. Taking this trip in summer was pretty unusual for me as I prefer shoulder or off season and cooler weather, and I think the heat caused some issues with doing everything I wanted to which is a bummer and something I need to keep in mind when I plan stuff. 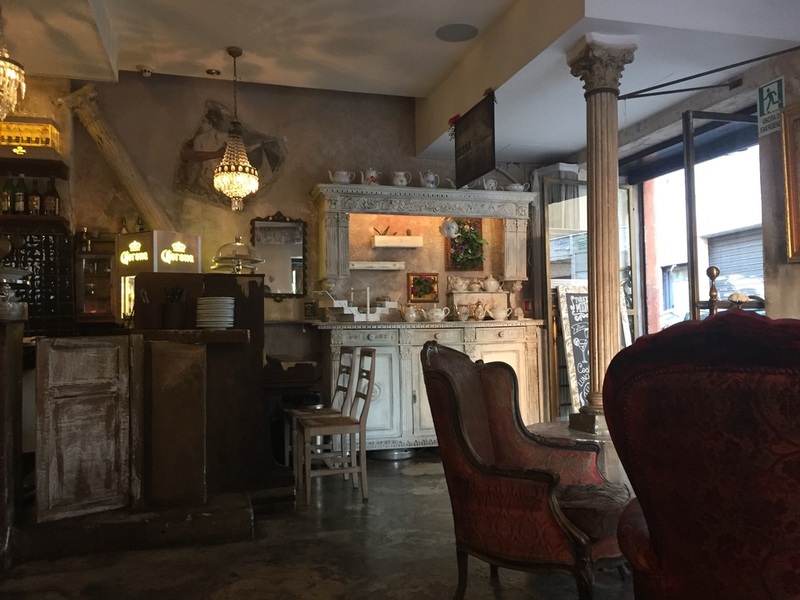 But what I did see was lovely, Trastevere is a gem of a location to stay in and I would strongly recommend it even though it's not in immediate walking distance of the major attractions. It's streets are the Rome you picture in your head, picturesque and lively.